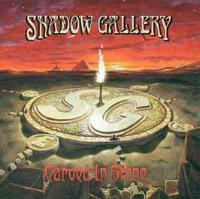 As prog metal goes, Shadow Gallery in many cases comes the closest to crossing the line into pure prog. With Carved In Stone they created a work that foreshadowed great things to come from the group. Although certainly not the best disc in their catalog, the album is a solid listening experience and would be a welcome addition to the collection of any fan of the group. It is always good to see just where a band that you like began developing their style. Keys (mostly piano) start this cut off, and as the guitar texture enters it is in an acoustic movement that feels briefly as if John Carpenter could have written it. A haunting melody emerges and begins working through for a time. Then the sound of an airplane flies by an all-new metallic theme with neo-classical and eastern leanings enters. The overall texture calls to mind Ritchic Blackmore's Rainbow (circa Rising). 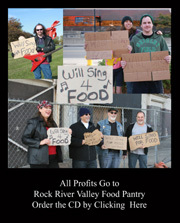 The cut also shares musical ground with bands like Fates Warning and Queensryche. A fast paced progish instrumental break serves as a powerful centerpiece here, getting very neo-classical at times. Shades of Deep Purple also emerge at times. Dramatic keys begin this one and gradually start to build. After a time the metallic fury enters, and a new metal based song structure comes in - again calling to mind Fates Warning. The rhythmic structures on this one get quite interesting. Overall this is pretty straightforward, though. That said, the instrumental break is very cool. It resolves into a short, sedate keyboard solo segment that is quite evocative. Keys, dominated by classically tinged piano starts this one. The track's first vocal segment is based on this foundation as a potent balladic style. Eventually the intensity kicks up, turning this into a hard-edged metallic ballad. It alternates between these two modes for a time. The evocative vocal performance steals the show here. The instrumental arrangement does get rather dramatic at times, though. More expressive piano starts this, feeling quite in the mode of Brahms at times. The vocals begin, accompanied by just this backing. After running through for a time in this way it turns hard-edged, but the same basic premise. The arrangement gets rather lush in the overlayers at times. The guitar solo is all flash metal, though. At just over 2-minutes this is easily the shortest piece on the CD. It is a pretty piano based instrumental with some minor accompaniment. Screaming out of the gate, this one is all power, fury and speed. It calls to mind Dream Theater at times. It changes into more prog territory as it moves into the second movement. This one starts with an intricate balladic mode. It continues building on this basis for quite a while. The arrangement because considerably involved at times, but it doesn't wander too far from its thematic roots. This one shows no signs of metal, instead coming across as a full on prog ballad and is rather pretty from time to time. The first movement comes in hard edged and anthemic, feeling a bit in the mode of old Rush at times. Then it shifts gear for a time to a section with an almost reggaeish rhythmic texture that is dominated by keys. When the vocals come in it feels a bit like a Rushish arrangement again. As it moves forward, though, the texture turns to something closer to bands like Royal Hunt. The cut shifts gear after a couple minutes to a full on prog metal jam that gets both intense and also rather heavy. This runs through for a minute or so before fading down to effects and atmospheric keys. This starts building in rather creepy space rock ways. Then acoustic guitar enters the mix and starts slowly evolving. It runs through for a time, then an off-kilter sounding acoustic mode takes the composition to run through a new element before dropping to atmosphere. A slight melody with processed vocals enters. The cut eventually jumps up to hard-edged darkly metallic tones. Then a new dramatic droning ensues and more effects driven keys dominate, all in a non-melodic, textural way. The cut suddenly bursts out with renewed power, working through a new, hard edged but progish arrangement. This resolves into a melodic segment that heralds more melodic growth. A guitar solo emerges over top in neo-classical fashion. As the vocals enter the cut takes on Rycheian tones. The arrangements get quite complex with choir-like vocals and a fast paced prog oriented instrumental break explodes out after a time, heralding a series of new changes. At one point a Wakemanesque keyboard run leads to a Yesish break, but fast paced metal fury comes out of this eventually. This runs through, then drops to atmosphere. Fast paced neo-classical piano pulls the cut out from there, building and rebuilding its themes for a time. This feels a bit like Beethoven in places, but also seems a bit out of control at other moments. This acoustic piano solo segment runs along for almost 3 minutes, then a flash of fury and power heralds in a metallic interlude that drops off giving way to a mellower proggy section. This evolves into a melodic balladic mode with lots of style; eventually becoming more hard edged while still retaining its central themes. This crescendos to end. After a time of silence a knocking as on a door enters. It becomes increasingly insistent. After a couple minutes the door opens, then closes and keys wash over the silence. A dramatic sweep of power emerges, then a pretty piano melody accompanied by waves of atmosphere takes the cut. After building on these themes the cut intensifies. The keyboard elements continue working and reworking, joined only by the occasional percussion, for quite some time. Eventually the band joins in, adding to the arrangement only as accompaniment. This makes for a nice album closer.